In 1901, off the coast of Antikythera, Greece, divers found a shipwreck. Along with many other items of archaeological importance, they found something quite unusual. It has been dated to about 160 BC and has been named the Antikythera Mechansm. It may not look like much anymore, but it is so remarkable for its time that it’s an anachronism, a device more out of place than finding a laptop computer in the American Old West. 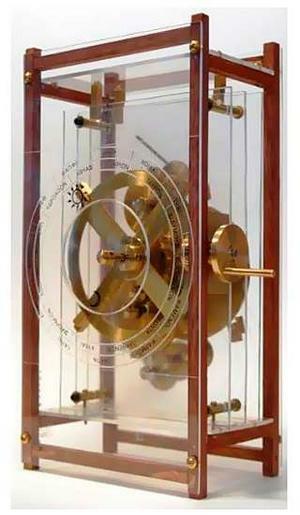 A gear driven analog computer, using technology that would not become common until renaissance Europe, this machine was built to accurately track the motions of the moon and known planets across the sky. 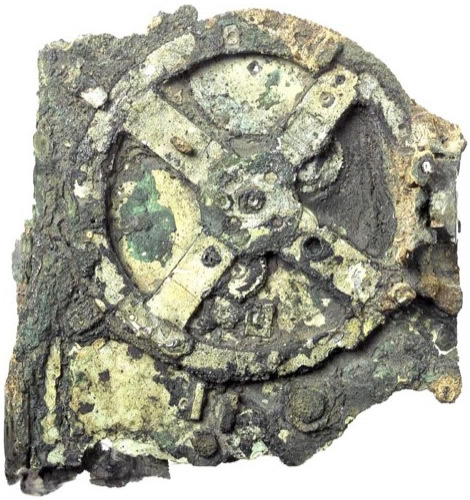 Whoever built this mechanism knew the earth and planets revolved around the sun, an idea not reaffirmed until over 1500 years later (in the face of great persecution) by scientists such as Copernicus, Kepler and Galileo. Below is one modern model of what this device may have looked liked (with a clear case, instead of a brass one. Several working models have been built and confirm the original was so accurate, it could predict eclipses even in our time. How did this brass device end up on the bottom of the sea, off the coast of an obscure Greek island? The novel, Gears of Uriel, tells a legendary story that answers that question.